Porcelain veneers are a highly utilized and versatile tool in a cosmetic dentist’s toolbox. These tiny pieces of porcelain are bonded to the front of imperfect teeth, where flaws are most noticeable, to transform their appearance. 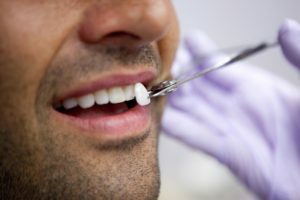 In this post, San Francisco cosmetic dentist Dr. Samir Ayoub discusses some of the many ways that he can make over a smile using porcelain veneers. Porcelain veneers are a fantastic way to conceal minor surface damage to the teeth. If you were to chip one of your front teeth biting into something hard, or slightly crack a tooth in an accident, porcelain veneers could be placed over the tooth to hide the damage. The veneer also helps protect the chipped or cracked tooth from the damage spreading. Some teeth develop stains that don’t respond to teeth whitening treatment. If that is the case, you can opt to simply cover the tooth with a veneer so it looks whiter and brighter. Veneers can camouflage other flaws, like crooked teeth, alignment problems or uneven tooth edges. Another common use for veneers is to create uniformity between the teeth that show when smiling. Perhaps you have one or two teeth that don’t match your surrounding teeth in shape, size or color. Or maybe as a result of nighttime grinding, some of your teeth look shorter than the rest. Dr. Ayoub can place customized veneers over specific teeth to create greater harmony and balance in your smile. Veneers are also a great way to close noticeable gaps between the front teeth. Bonding is often recommended to hide gaps, but veneers normally last longer. The veneers are created to slightly widen or elongate teeth, closing tiny spaces. Porcelain veneers are created in dental laboratories from high-quality blocks of porcelain. Your veneers will be carefully fabricated to blend in with your natural teeth for a seamless result. For more information about the uses for veneers and the design and placement process, please book a consultation with Dr. Ayoub. Call or email us today at San Francisco Aesthetic Dentistry to make your appointment.